I truly am stunned by those pics & finds! Been SCUBA diving the coastal shores of the Western Cape for many years, but NEVER seen anything like that. Hell, how do they do that? Well done to find the newspaper article. The coins shown are the first coins made by the Spaniard colonisers at the Mexico Mint during the years 1542 to 1555 . They seem all to be 4 Reales although the exact details of all denominations are not given. I expect there to be some variety unless this ship was only to take coins from only Mexico to Spain. 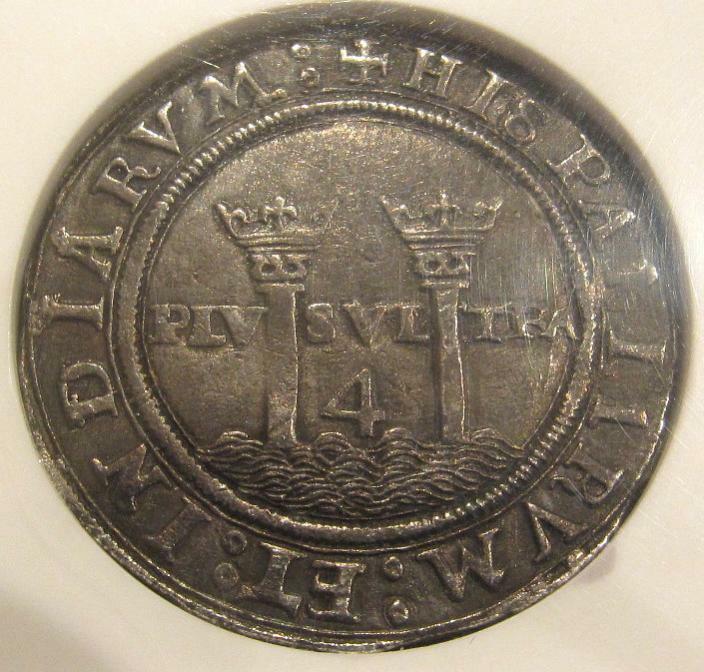 Divers are often very cagy about what they find and how much.I doubt whether many coins will be gradeable though after all the sea damage but will find a ready market as wreck coins from THAT shipwreck along with a COA. Our Portugese wreck from the West Coast worked in De Beers area had coins going back to 1480 (Ferdinand and Isabela) as did the Santiago wreck on Basos da India off Mozambique. Herewith are some pics of such a Mexican 4 Reale that I have in my collection, graded AU53 and won on Heritage Auctions in September 2009 for $695 (R5282) incl BP. The two Pillars shown on the reverse signify the Pillars of Hercules (Straits of Gibraltar) and the PLVS VLTRA means from Latin "More Beyond" The slogan of the early Spanish explorers that they had found other land beyond what was known at the time. 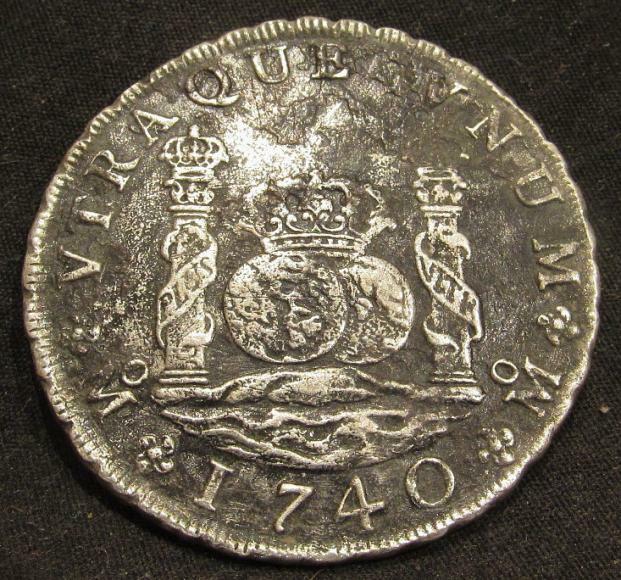 The two Pillars became the two downstrokes of the US Dollar eventually and the S was a simplification of the two worlds (dos mundos) found on later Mexican Silver 8 Reale Coins - see pic of coin from the wreck of the Reigersdal - Springfontein point - Cape - October 1747. The large amount of silver coinage aleged to have been found on the recent shipwreck is a small indication of the positively huge amount of silver coinage that the occupying Spaniards had minted at Mexico City Mint. Hernando Cortez captured the Aztec Capital Tenochtitlan (Mexico City) in 1521 and by royal edict in 1535 , King Charles I also known as Charles V (Holy Roman Emperor) established a mint at Mexico City . According to the still existing Mexico City Mint Records, nearly 70 million Gold coins and over 2 billion Silver coins were produced there between 1537 and 1821. Even after such extensive exploitation, Mexico is still the leading producer of the world's silver. The reason behind having a Mint in Mexico City lay in that the silver ore was not appropriate to send back to Spain. Silver coinage was by far preferable and could be used immediately as money back in Spain.In the same way other mints were started as colonisation spread south to Bolivia (Potosi) and Peru (Lima). 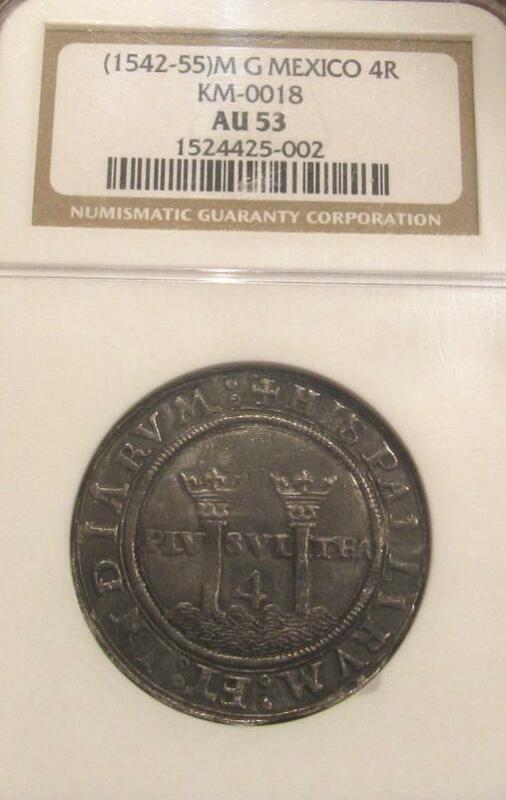 There was thus a mass movement of these minted coins back to the colonizing Spain by ship who used them to build unsurpassed wealth and support the absolute Monarchy thanks to their colonies. 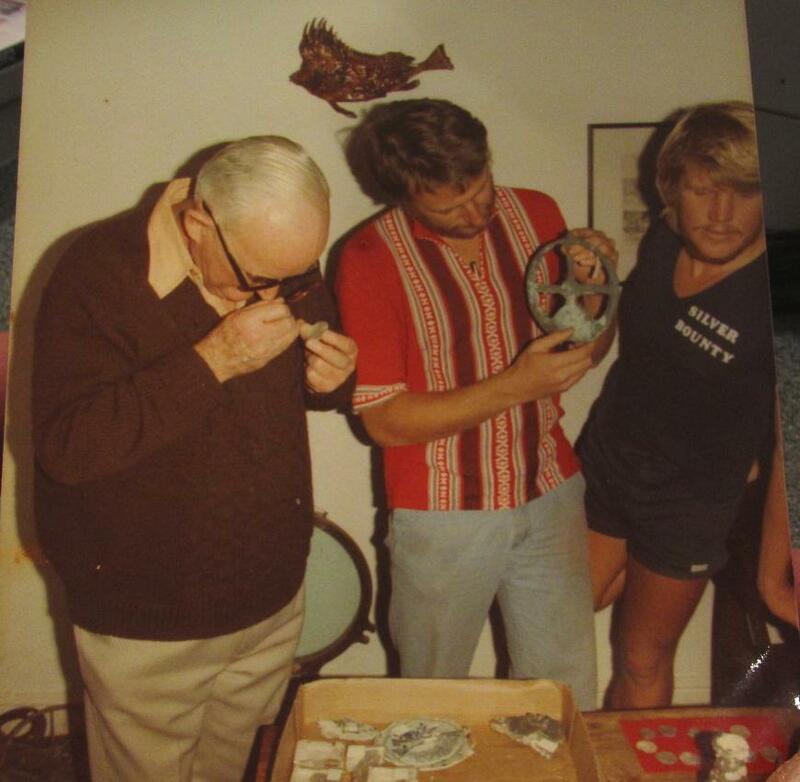 Here is a pic I took of the late Dr Frank Mitchell when he came around to inspect the coins and artifacts found by my friends on the Wreck of the Santiago (wrecked Bassos da India 1585- off Mozambique) in 1984. He is on the left examining one of the silver coins found amongst 150 Kgs and the man in the centre is holding the Astrolabe (navigational instrument from the wreck) - a fascinating find. This wreck was an unsung treasure indeed. The wreck of the Santiago (1585) on Basa da India occured because the coral reef arises from the depths and being coral is submerged at High Tide becoming invisible until too late. For this reason, the reef has collected shipwrecks over the centuries. The ship was outward bound with that year's payment in coinage for the spices received by Spain. Other artefacts from the wreck were of interest. They included human remains because (as always) there were not enough lifeboats for the people on board and people fought each other for a position therein. 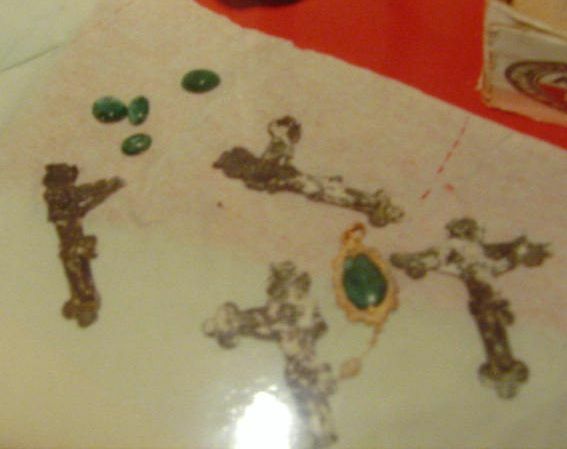 Others were the remnants of earthenware jars , emeralds and crucufixes meant for the missionaries in the East. (See pics taken by me in 1984). 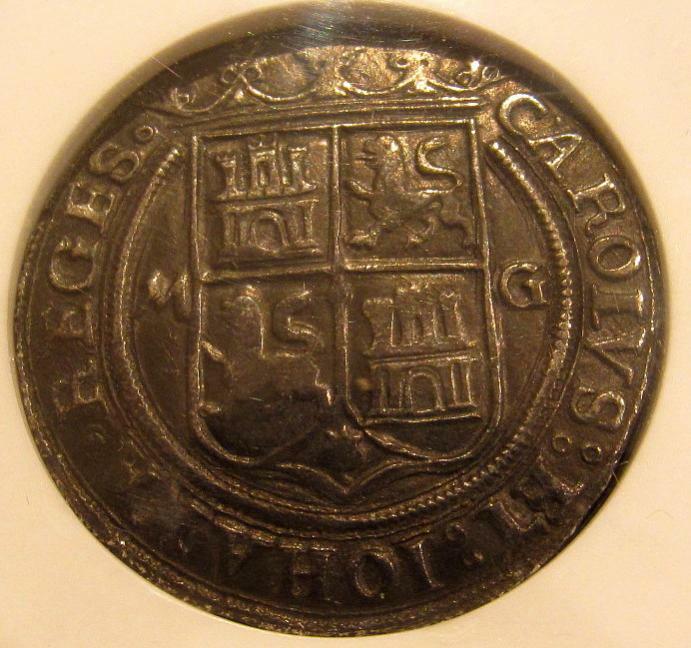 Coinage spanned the reign of three rulers of Spain from 1480 to 1585 (Ferdinand and Isabela who sent Christopher Columbus, Carles I /V of Holy Roman Empire and his mother Johanna and Phillip II of Inquisition fame) 8 bronze canons were found as well.